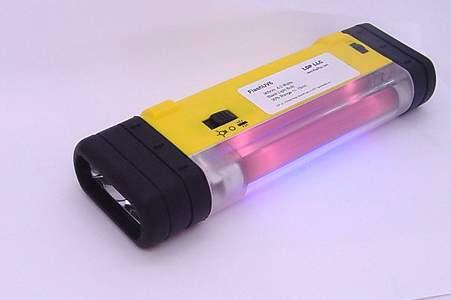 Our FlashUV6 and FlashUV8 365nm/ Blacklight light are a convenient tools for portable, UV illumination. They have both a side 365nm 4 Watt light and a front Krypton flashlight bulb. Durable, convenient multi-function light. FlashUV8 model with front suction cups. 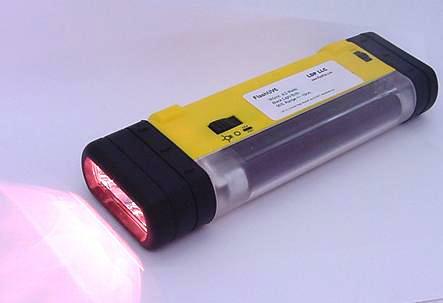 The FlashUV8 is useful when you need to attach the light to a smooth surface. 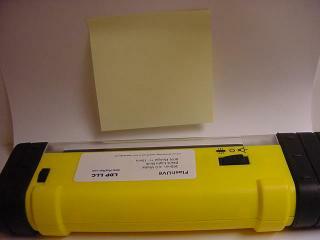 Common uses are when using a UV curing adhesive such as those used for windshield repairs, optical adhesives and UV curing epoxies. 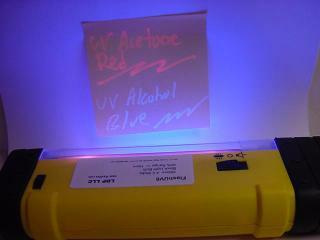 Example pictures showing the FlashUV6 illuminating our Alcohol and Acetone based invisible inks. Normal Light. Ink is invisible. 365nm / Blacklight. Ink is visible.